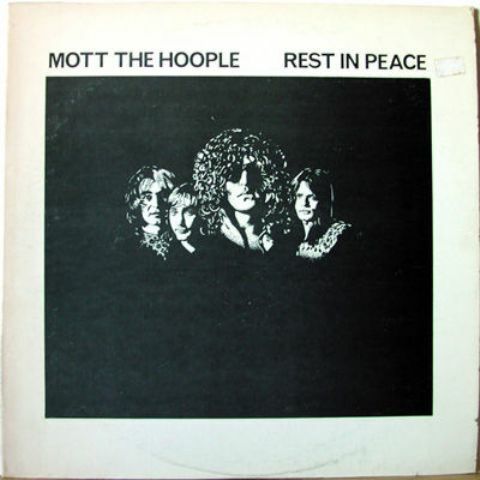 Source: FM broadcast of Mott’s second performance at the Santa Monica Civic Auditorium in April 13, 1974. 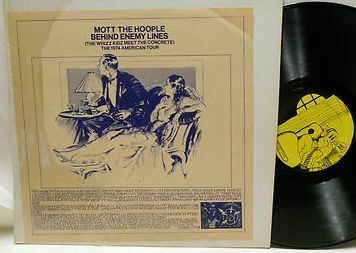 They played two shows that day (matinee and evening), and the second of those shows went out live on a local FM station. “Behind Enemy Lines is from the same show as “Rest In Peace”*. Given that the entire show was broadcast on FM, it is a shame that it was edited down to fit on a single LP. The sound is down a couple of notches as well, which again spoils the listener’s enjoyment. The running order is different as well, presumably for scheduling reasons. 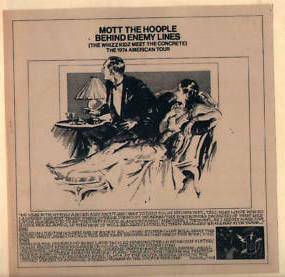 “The source of this 2-LP set is an FM concert of Mott’s second performance at the Santa Monica Civic Auditorium in April 1974. They played two shows that day (matinee and evening), and the second of those shows went out live on a local FM station. The performance is strong, and the mix is good, although Ian’s voice is slightly hoarse after the earlier show. He is, though, on top form, laughing and joking with the audience.